The lush greenery, clean beaches and picturesque landscape make the Calicut beach a favorite tourist destination. The beach is also a preferred haunt for sunset viewers. A seafood lover will love the fact that he/she can try out seafood delicacies like kallumekaya (mussels) which can be bought at the stalls lining the promenade. A walk at dawn along the famous Dolphin’s Point will allow you to catch a glimpse of playful dolphins – a truly beautiful sight. Besides its natural beauty, the beach has an old-world charm to it owing in part to the presence of the old lighthouse and two crumbling piers that disappear into the sea, with a combined age of over a hundred years. For the children, one can keep them occupied at the Lions Park. Proximate to Kozhikode railway station. Love this? Explore the entire list of places to visit in Calicut before you plan your trip. Fancy a good night's sleep after a tiring day? Check out where to stay in Calicut and book an accommodation of your choice. How popular is Calicut Beach? People normally club together Kappad Beach and Canolly Canal while planning their visit to Calicut Beach. One of the famous place in kerala. A lot of people visit the Kozhikode beach. 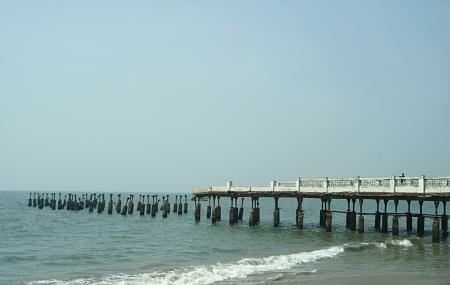 It is one of the most fascinating tourist destination in the district of Kozhikode. It is also one of the busiest places in Kozhikode district. This place is suitable for every of people. Good place. Best place for spending our time. And also for children a park is here. Not a pristine beach but you can have fun here , tends to get crowded in the evenings . I watched a beautiful sunset . There was a lot of street vendors selling all those things nostalgic. Vegetables in brine and vinegar is sold by most of the vendors , although hygiene is questionable , i still are some .